Since Stanwells first opened its doors in 1996 in the picturesque yachting town of Lymington in Hampshire, it has grown into one of the south of England's most successful independent boutiques. Now with another store in Westbourne near Bournemouth, the mix of designer labels is an ever growing one. 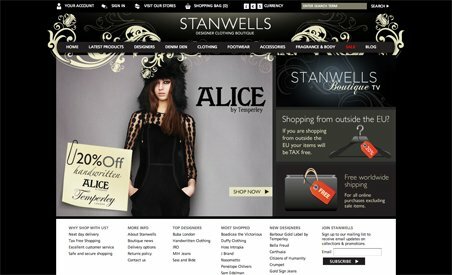 Stanwells offer a stylish mix of designer and contemporary brands, and with a fashion literate clientele, the buying team are constantly sourcing new emerging brands to refresh its fashion profile.